​The current winter conditions are regrettably perfect for the forming of Ice Dams on roofs and gutters in Central Oregon. 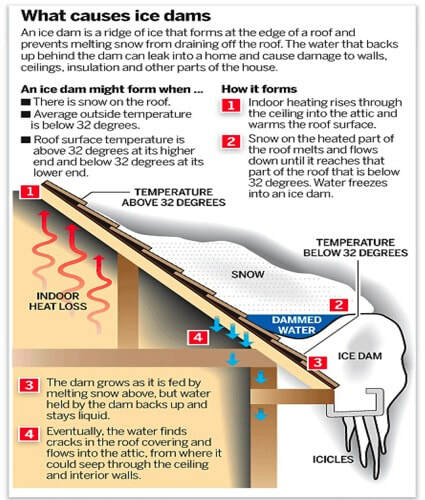 For anyone unfamiliar with ice dams, how they are formed and the damage they can cause, please have a look at this diagram and read below. Essentially, water melts off the roofs from warming outside temperatures and heat rising from the interior of the home through the attic space. The edge of the roof and gutters are not as warm, and will sometimes re-freeze the water. This cycle repeats, and you have a dam of ice blocking any more water from falling off the roof. The water puddles behind the dam, gets up under the roof shingles and can cause water damage to the ceiling and interior walls. Left unnoticed and unchecked, this can end up causing interior damage. So, how do you know if you have an ice dam? Look closely at the icicles around the exterior of your house. If the icicles are confined to the gutters and there is no water trapped behind them, then an ice dam has likely not formed. Nonetheless, icicles can be a precursor to ice dams. Check for water stains or moisture in your attic or along the ceiling of exterior walls of your house. Water stains or moisture may be an indication that an ice dam has formed and water has penetrated the roof. Get professional help. Have a roofing company come out and inspect all the roofs, removing ice, snow and formed dams. In the future, the key to stopping ice dams is simple, in principle: Just keep the entire roof the same temperature as the eaves. You do that by REMOVING SNOW from your roof, increasing ventilation, adding insulation, and sealing off every possible air leak that might warm the underside of the roof.